Shah Wali Allah made the first attempt to reconcile the two (apparently) contradictory doctrines of wahdat al-wujud (unity of being) of Ibn al-‘Arabi and wahdat al-shuhud (unity in conscience) of Shaykh Ahmad Sirhindi. Shaykh Muhyi al-Din ibn al- ‘Arabi, the advocate of wahdat al-wujud, was of the opinion that being in reality is one and God. All other actual and possible beings in the universe are manifestations and states or modes of his Divine Names and Attributes. By the act of creation through the word kun (be), Ibn al-‘Arabi means the descent of Absolute Existence into the determined beings through various stages. This gradual descent of the Absolute Existence is called tanazzulat al-khamsa (five descents) or ta’ayyunat al-khamsa (five determinations) in Sufi terminology. 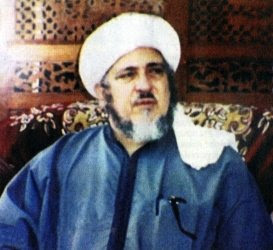 On the other hand, according to Shaykh Ahmad Sirhindi, the exponent of the doctrine of wahdat al-shuhud, God and creation are not identical; rather, the latter is a shadow or reflection of the Divines Name and Attributes when they are reflected in the mirrors of their opposite non-beings (a’dam al-mutaqabila). Shah Wali Allah neatly resolved the conflict, calling these differences ‘verbal controversies’ which have come about because of ambiguous language. If we leave, he says, all the metaphors and similes used for the expression of ideas aside, the apparently opposite views of the two metaphysicians will agree. The positive result of Shah Wali Allah’s reconciliatory efforts was twofold: it brought about harmony between the two opposing groups of metaphysicians, and it also legitimized the doctrine of wahdat al-wujud among the mutakallimun (theologians), who previously had not been ready to accept it.